The modularity of the Primozone technology minimizes stand-by needs. 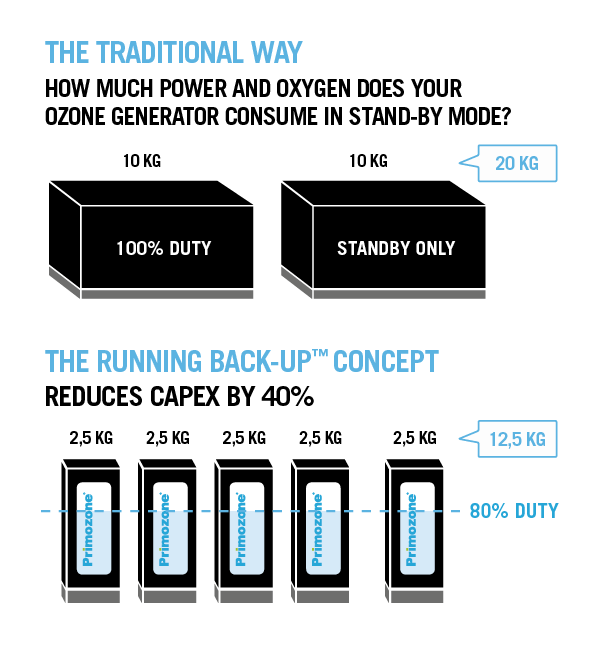 Traditional ozone generators require installation of a duplicate of each ozone generator for backup. With Primozone, you will need (at most) to add a module that represents 50% of the capacity. In this case you only need a stand-by module that represents 25% of the overall capacity with a total saving of ≈ 40% in CAPEX. Will I still have off-gas with ozone that is infused in high concentrations? A: Yes, but higher concentrations means smaller gas volumes, reducing the size and cost of the off-gas systems and the energy required.